App'd, from Pinche Games, is a new single-deck card game looking to get themselves funded over on Kickstarter. Go check 'em out. App'd is a game for 2-4 players where players try to be the first to fill up 100% of their brain's space with apps without going over. Players draw cards from the deck hoping that they will get app cards, expansion cards or hardware cards that will help them reach that goal of 100%. 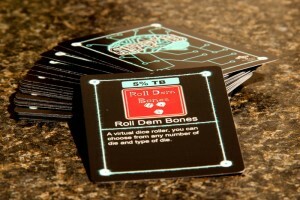 App cards are apps that the players can play to fill up their brain, these cards have fun names and short descriptions that are fun plays on things already in existence and some are gamer centered like "Roll Dem Bones" that is shown above. Expansion cards are simply expansions of the app, such as a gold or silver addition, that provide additional percentages to increase the value of the app. Hardware cards allow the player to upgrade themselves so that they can play additional apps or skip certain phases of play. It all seems simple enough put nothing in life is easy.